How in the world did this Midwest-grown girl end up in El Paso, Texas, anyway? The question surfaced last week as I reflected on the last few years in light of impending life changes. My time at the U.S.-Mexico border is coming to an end, at least for now. Andrea and I will move into a community near the Sisters of Charity Motherhouse in June to begin the next step in formation, Novitiate. Of course, my heart is full with many emotions about the looming transition. I shared some of those emotions with our neighbor, Dominic, and he offered this centering advice: Whenever I find myself in an unsettling moment, I think about how God has carried me to, through, and beyond all of my previous unsettling moments. I smiled, knowing the words to be true. When I look back and connect the dots that led me to today, it’s easy to see God’s fingerprints all over the story. 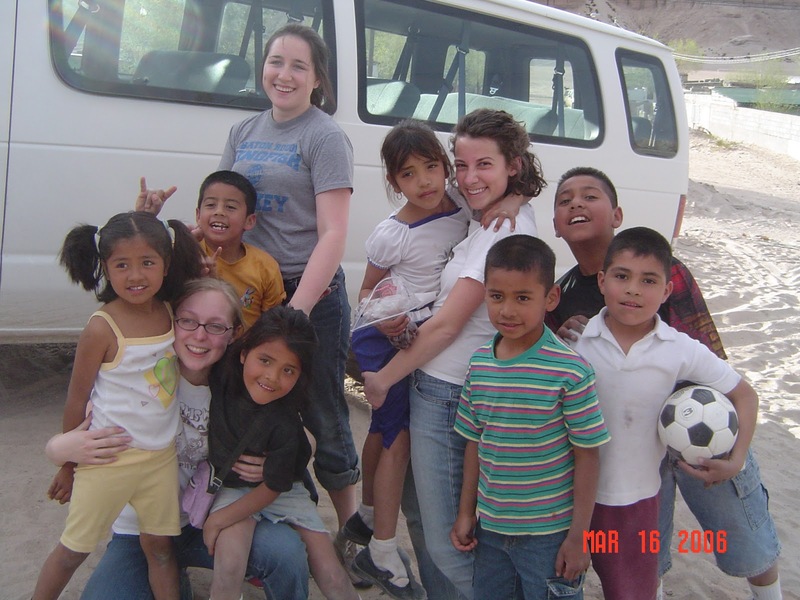 During my sophomore year at the University of Dayton in 2006, Sr. Laura Leming, who I mentioned in my last post, encouraged me to go on a Spring Break Border Immersion trip to El Paso and Ciudad Juarez, Mexico. Our immersion was directed by Annunciation House, a shelter for undocumented migrants in El Paso (that I ended up volunteering at after moving here). We stayed in one of their houses, Casa Emaús (Emmaus House), in Anapra, Mexico, and spent the week visiting outreach and human rights organizations on both sides of the border. I’ll never forget crossing the bridge into Mexico for the first time. We peered out of the white van at the fences, floodlights, patrol cars, and barbed wire that stood as a strange and appalling division between our countries. It was the first of many eye-opening moments. I had never been in a neighborhood like Anapra, and I had never seen so up-close the struggles facing people living in poverty, especially those in migration. 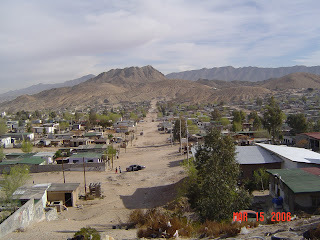 The experience of meeting and talking with fellow human beings who live in such desolation, violence, and injustice seeped into my heart and moved something in it. I clearly remember sitting on the porch of Casa Emaús the last night. I stared pensively over the tiny houses and absorbed the sounds of dogs barking and Hispanic music that floated into the warm night air. I wrote these words in my journal: My life is never going to be the same. My time at the border stayed with me, and I grew ever more passionate about understanding the plight of the modern-day immigrant. I added a minor in Sociology and studied abroad to strengthen my Spanish skills. When it came time to develop my Honors thesis project as a Junior, I knew I wanted to study something in the ballpark of immigration. Dr. Theo Majka, professor of Sociology and resident Immigration expert, agreed to advise me on a project that would send me back to the border for research. When I presented the idea to the Director of our Honors Program, however, she said that their office could not financially support me in a project that would take me to a potentially dangerous place (Before the drug violence escalated in 2008, Ciudad Juarez was known for a horrible femicide). I was crushed. Now what? First things first - my boyfriend took me to our favorite Mexican restaurant to cheer me up. The next day, I had lunch with Clare Acosta (nee Strockbine), a grad student at UD and wonderful friend and mentor. I told her everything and asked if she might have any ideas on how to adapt the project and do it in the Dayton area. She put her utensils down, and looked at me intently. “Tracy, you are GOING to the border! You HAVE to! Go home tonight and write a fundraising letter. Send it to as many people as you can think of. This is going to happen.” How could I say no to her enthusiasm? I know now that hers was the voice of God. Later that night, I wrote and revised furiously. I sent the request for funding out at 4 a.m. to anybody and everybody - departments, organizations, and people - I could think of that might have funds to support me. After crashing and getting up at 9 a.m. for class, I sleepily opened my laptop. To my utter shock, in my inbox were reply emails guaranteeing hundreds of dollars already. By the end of the day, I had been offered more financial support than I needed. I was going to the border! Now, I could make plans. I started putting out feelers to find places to stay and people to interview. A quick online search of universities in El Paso took me to the Campus Ministry page for the University of Texas at El Paso (UTEP). I emailed the Franciscan priest who was listed as the Director, Fr. Henry Beck. He replied quickly and told me about a small community of Sisters who lived outside of El Paso and often offer hospitality at their home. A day later, I received an email from one Sr. Janet Gildea saying that she and her housemates, Sisters Carol and Peggy, would be happy to host me. I could never have guessed then the profound inspiration and love these three women would bring to my life. I spent my week doing research with the Sisters here at Casa Caridad. I even stayed in the room that is now my bedroom. I visited their clinic, Clínica Guadalupana, on the East side of El Paso. They shared evening meals and wonderful conversation with me. Sr. Janet took me over to Mexico to visit their clinic for children with special needs, Proyecto Santo Niño. I was in disbelief as we pulled up to the little white building. It was right next door to Casa Emaús where I had stayed almost 2 years before during the immersion trip. My experience with the Sisters impacted me greatly, but becoming one of them was just not really on my radar then. Even still, I stayed in touch with Sr. Janet, and when I started to feel “the call” in Ecuador, my mind wandered to Casa Caridad. Perhaps I could volunteer with them, I wondered. The pull to the border that I felt at UD had not gone away. Although the thought scared me, maybe, just maybe, living and working with them would be the perfect way to get a no-strings-attached closer look at what it is to be a Sister. Well, as you know, the rest is history. Although I grew up in Cincinnati, it took going over 1,500 miles away to find the Sisters of Charity of Cincinnati. The Motherhouse is less than a mile away from the house where my Mom grew up. How many times did we drive those roads to Grandma and Grandpa’s home in Delhi, never guessing that my future home would be right around the corner? God is so darn clever! I finally met Fr. Henry Beck, who had “e-introduced” me to Sr. Janet, in person in 2011, shortly after I decided to enter the SC’s. “This is all your fault, you know,” I told him, smiling. “Oh, I’m so glad!” he replied and wrapped me in a hug. These last few years have been so blessed. The border continues to be a special place. I’ve found purpose and grace in my service at Annunciation House, Proyecto Santo Niño, and Sacred Heart Church. And Casa Caridad – oh man. It’s a place that holds for me memories of great joy, pain, growth, and love. It’s a place that set my heart on fire and filled it with dreams. It’s a place that holds people who have become my family. It is home. There are moments of sadness when I wonder how I’ll ever be able to leave Casa Caridad. At the same time, there is excitement, gratitude, and a deep sense that all is as it should be. I felt that yesterday when Romina, Peggy, and I “Skyped-in” to my friend Annie’s beautiful Pre-Entrance Ceremony at the Motherhouse, her first official step of discernment with the SC’s. Admiration, pride and love for Annie abounded as she said a brave “yes” to the journey with her parents and Sisters by her side. After the ceremony, we waved and chatted excitedly with them on the screen, and the palpable sense of family made it feel like we weren’t halfway across the country. And so, I was reminded: as I leave one home, I am going to another. Sometimes life is funny this way. God blesses us with “family” in many places along the journey, and all of the sudden, “home” could never be contained in just one of them. Andrea and I will be welcomed by our Sisters of Charity family, especially by Sr. Donna, the Novice director, and by Sisters Nancy, Maureen, Carol, and Terry, who will be our new house community. And I’ll be in same city as my biological family for the first time since I left for college. As I talked the transition over with my spiritual director, Vero, she reminded me the most important thing in all of this – that as I go, no matter what’s happening around or inside me, I can and must hold on to God. I go forward with hope, knowing that the sneaky, creative, and wonderful God who brought me to the border in the first place is the same One who walks beside me into the future. When we know our true home to be in God, of what should we be afraid? Bring on the Novitiate! "When we know our true home to be in God, of what should we be afraid?" No matter where any of us are in our lives, this statement will always be true. It definitely resonates with me at this moment. Blessings on the next step of your journey. I look forward to seeing you at MSJ. Your journey so far has brought a tear to my eye. God Bless!